— You, too, can join the ranks of the millions of successful people. — Don’t cap your income with just a job. Uncap your earnings and potential assuring the security of your family by joining the millions of sales professionals. — Start your training today. Act now! Price includes shipping within the continental US only. For orders outside the continental US, please contact us. Please allow 7 – 10 days for delivery via FedEx or USPS. Learn: Time Management, Marketing Tips for Social Media Ads, How to Overcome Rejection – Perfect Your Elevaor Pitch, How to Add Value to your presentation. Look around you. Everything you see was bought and sold by someone. 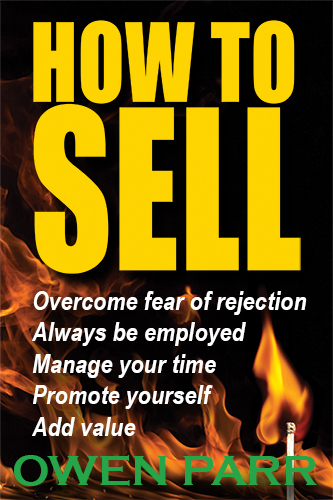 If you are considering a sales job, are in one and are wallowing in the valley of mediocrity, or you just need a “starter match” to get back on track, this book is for you. 1— How to overcome fear of rejection. 2— How to be persistent without being a pain in the you know what. 3— The four different types of time & how to manage them. 4— How to add value to your sales relationships. 5— The difference between clients and customers. 6— How to set short and long-term goals which work. 7— How to motivate yourself without relying on others. 8— How to promote yourself. 9— How to spot customer wants and needs. 10— How to develop conviction and enthusiasm for your product(s) and service(s). 11— When to stop selling and start closing. 13— How to plan your work and work your plan. This succinct and to the point self-help book can change your life. Applying the principles and techniques discussed in this powerful “How-To” book can inspire you to a bigger success in sales or the start of a new “unemployment-proof” career in sales. Owen Parr has been employed full-time in the sales profession for the last forty years and counting. He started in part-time sales at the age of 12, selling greeting cards to neighbors and friends of family. He was always employed while in elementary school, high school, and later college by selling something. He studied electrical engineering and worked for the electric utility in his city until boredom set in. He quit, giving up all the “security” of a salaried job and went into commission- only real estate full-time at the age of 26. After just 2 years, he became a sales manager of a branch and a sales trainer with the organization. Three years later, he opened his own real estate company, developed a training manual covering A to Z in sales, and opened a real estate licensing school. Within 2 years, he had opened 5 branches and had grown the company, with assistance of partners, to over 100 real estate associates. In the middle of a personal boom and success, the U.S. economy, circa 1983, went into a funk and depression with Prime interest rate at 21% and unemployment at 10%+. Mortgage rates reached 19%. Needless to say, few could afford to buy a home. He sold his company for a fraction of its value and started a new career in the financial industry where he is still employed today after 30 years. Owen has been up and down as much as a rollercoaster, but since he went full-time in “sales,” he has never been unemployed. Now he shares both the success principles he learned and still practices, as well as some moments of trial and despair, with ideas on how to overcome them. His “starter match” was the day when he arrived at his home to a loving wife, two daughters, a dog, and a mortgage, and his wife told him, “We have a balance of $1.00 in the checking account.” Years later, with the satisfaction of having put his daughters through private school and college, seeing them married and with children off their own, Owen feels blessed and knows life is great when you take charge of it.